TorGuard VPN has become a worthy opponent in the field of VPN services provided globally. Seeking to combine modernity alongside efficiency, advanced encryption and the power and versatile nature of DNS with the VPN, TorGuard VPN is a solid solution. In this article, we are going to focus primarily on the TorGuard VPN Android app available to the customers. In this way, we are going to conclude as to whether or not it is worth considering this service provider for getting the best user experience on your Android. So, stick with us and see! If you are interested in downloading the Android app of TorGuard VPN, you can do that pretty easily from Google Play store. There, you will get the opportunity to check through the interface. The design is cool, modern and appealing to most users. It is clean and intuitive, with black color wallpaper and light green touches, as well as white letters. 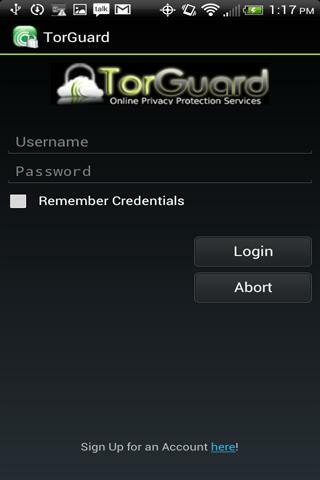 The logo of TorGuard with the cloud prevails on top of the screen. You can sign up for an account right from the app, before you log in. Apart from that, one-click connect is available for the optimum convenience to VPN users with Android running devices. You can choose the server that you are going to connect to and all the updates of new servers (over 1,000 VPN servers internationally in more than 43 countries and with a growing network) are added automatically. As for the data that you get about your connection from the app, you get information about the duration of the connection and the bytes sent and received. You can disconnect with the click of a button and cancel, too. One thing that will get a big smile on your face is the fact that you do not need to worry about anonymity, as no logs are kept. Let’s go on with the special features that Android users can benefit from at TorGuard VPN. First and foremost, you get unlimited bandwidth and impeccable speed. You have read about the rich network of VPN servers earlier; in addition, the Stealth VPN service is able to overcome any firewall and obstacle getting in the way. You can have a look at the detailed how-to guides that have been especially created for Android users here. In this way, you can learn more information about the security protocols (OpenVPN, PPTP, L2TP, IPSec, SSTP, ikev2) and how you can install the app to run on these protocols. Free Viscosity VPN Software License is offered to the subscribers, which can help you out get even better VPN services. Torrents and P2P file sharing are not frowned upon, which is quite a relief. Apart from all that, you will find it really pleasing to read that up to five simultaneous connections are allowed with a single account. TorGuard VPN blocks WebRTC bug and this is always welcome! There are four different plans available to the potential customers of TorGuard VPN, depending on the overall duration of the subscription. The monthly plan costs $9.99, while the quarterly subscription goes up at $19.99. You can also get 6 months at $29.99 and a whole year at $59.99. As you can see, the longer commitments offer more generous discounts to you. If you wish to be sure that you can get a full money refund guarantee upon dissatisfaction with the VPN plan, you need to know that this is possible just for a week after the purchase of the product. In addition, there is a restriction allowing up to 10GB usage till your decision of bailing out from the plan. No free trial is offered, either. As far as the payment methods are concerned, more than 80 alternatives are on offer. So, it is impossible for you not to come up with a reliable solution. Payment methods include Paypal and Bitcoin, credit cards and PaySafe cards, WebMoney and Subway etc. TorGuard provides VPN servers located in 43 countries around the globe. There are about 1,250+ anonymous VPN servers located in the following countries: Australia, Belgium, Brazil, Canada, Czech Republic, China, Costa Rica, Sweden, Switzerland, South Africa, South Korea, Denmark, Egypt, Finland, France, Singapore, Spain, Saudi Arabia, Tunisia, Thailand, Germany, Greece, Hong Kong, Hungary, Iceland, India, Latvia, Romania, Russia, Turkey, Indonesia, Ireland, Italy, Japan, Poland, Portugal, UK, Luxembourg, Malaysia, Mexico, Moldova, Netherlands, New Zealand, Norway, Panama, Vietnam and USA. Not all servers support torrents though. If you’re interested in downloading torrents with TorGuard, use these server locations: Canada, Netherlands, Sweden, Finland, Hong Kong, Iceland, Romania, USA (Dallas, LA, Miami), Norway, Switzerland, Poland, Luxembourg and Panama. Support is of excellent versatility in TorGuard VPN and this is definitely something you ought to be happy about. There is the live chat that you can use for instant feedback and there is the option of submitting a ticket for deeper investigation. A phone number is available, which is not something that many VPN service providers offer. The knowledgebase includes how-to guides and most popular articles, as well as FAQ sections. There is also a forum, community and a blog and at the bottom right of the website you can find links to their social media accounts. So, the support allows you to find the best way to communicate with the representatives of the company for the optimal user experience. On the downside, there have been some complaints about the turnaround of these methods – though we have used the live chat and the phone with great response times. We have covered all the aspects of TorGuard VPN Android app and the details of this VPN product. Now, it is the time for conclusions. First of all, nobody can argue that the interface of TorGuard VPN Android is cool and modern looking. There is great attention to the overall security layering and there are many special features that you can benefit from, including Viscosity and a wide range of VPN servers expanding daily. The support is versatile and there are a great many payment methods for you to go for, although the price could be a bit lower for monthly subscriptions (and with a free trial or a more generous full money refund guarantee). As a whole, TorGuard VPN respects Android users and this is why there are lengthy guides that include all the versions of Android OS with different security protocols (for your best experience). You can try it out, particularly since there is the option of adding up to five simultaneous connections and enjoying VPN on your tablet and smartphone at the same time!